Pride Mobility's LC-558 Lift Chair is the only of the Heritage line that has infinite position. It can lay completely flat with 180 angle of recline. 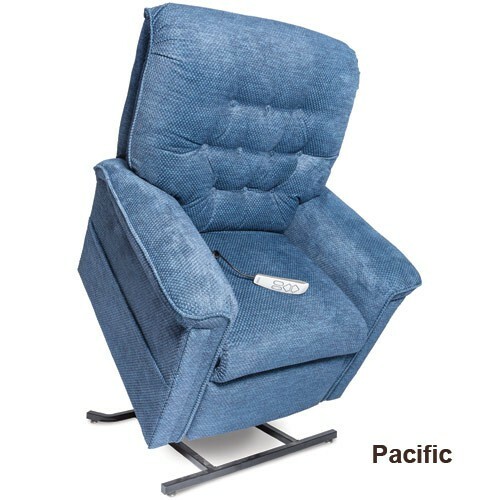 The chair has a plush Total Comfort seat and an equally comfortable button back cushioning. Optionally you can also order it with a headrest pillow and lumbar cushion for added comfort. The chair comes in a variety of over 10 different colors so you can be sure to find a fabric that complements the look of your room. The chair also features large storage pockets on either side so you have a place to put books, remotes and other items where they will be easily within reach. The chair back of the LC-558 is removable to enable ease of shipping and transportation. The back attaches easily and requires no screws or other complex assembly methods. The heavy duty lift actuator is more than powerful enough to quickly and quietly help you to your feet when it's time to get up and get going. The integrated backup battery ensures that you will be able to do so even if you experience temporary loss of power to the outlet. With the 7-year warranty you can rest assured that this chair can be relied upon. Vitality Medical also carries other items that would pair well with the Specialty LC-835 Lift Chair, such as the Elite Walking Cane with Seat by Mountain Properties.